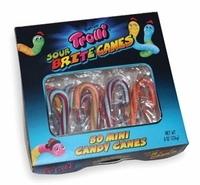 Trolli Sour Brite Candy Canes are a mini candy cane with a mixture of sweet and sour flavors all in one cane. You get Watermelon and Berry; Peach and Apple; Raspberry and Lemon. Although this seem like a strange flavor combination the kids love them. We carry a wonderful selection of candy canes. Choose from the traditional peppermint or try one of the new flavors. We carry Smarties Candy Canes, Sour Patch Candy Canes, Jelly Belly Candy Canes and Cherry. Each box of sour brite candy cane mini's has 50 individually wrapped candy canes. Hang these on your tree and watch them disappear.